It's the Holiday Season! That means it's time to get together with friends and family. Time to share gifts, drinks, and stories. Time to get fat and lazy after eating amazing meals. All of this can be very exciting and wonderful. However, this can do a serious number on your digestion. I figured that I could let you in on a tip to help keep your digestion going strong even after a day of gorging yourself on food you don't normally eat. Over the years, “Bitter” has gained a bad reputation. The word is most commonly associated with harsh feelings like anger, resentment, and pain. However, “Bitter” can be a wonderful and healthy tool to use. Bitter herbs help digestion, and a number of them are already in our diets. Coffee, most culinary herbs, and leafy greens are just a few examples. Even though we do continue to enjoy our bitter herbs, we don't have enough of them to really use their true potential. If you aren't tasting the bitter flavor, you aren't getting the benefit. But before I dig to deeply into that, here's a basic introduction to the world of Bitters. In Traditional Chinese Medicine (TCM), there are 5 flavors of food. Sweet, Salty, Pungent (sometimes referred to as Spicy or Acrid), Sour, and Bitter. Each of these flavors is associated with certain actions on your digestive system, as well as your body as a whole. Bitter herbs and foods help to stimulate digestion by triggering the production and/or release of digestive enzymes, hormones, and various digestive secretions (saliva, bile, etc). This action benefits the gallbladder, stomach, liver, pancreas, and just about your whole body. Bitters help us to properly digest proteins, fats, and starches. They help increase nutrient absorption, improve the integrity of the tissues lining the digestive tract, and help to create a protective barrier against pathogens. Most bitters are also cooling in nature, helping to reduce inflammation and rid the body of excess heat. They also help aid the elimination process. With such a wide range of bitter options available to us, why do so many health professionals think that the modern American diet is all but devoid of bitter flavors? Because sweetening the bitter flavors destroys most, if not all, of the health benefits. So eating those dark leafy greens in your salad is a great choice, but using a salad dressing packed full of sugar negates most of the healthy benefits. This is one of the reasons that herbal bitters are such a great tool for your health. The herbal bitters we usually refer to are mixtures of various herbal extracts designed to help aid digestion. 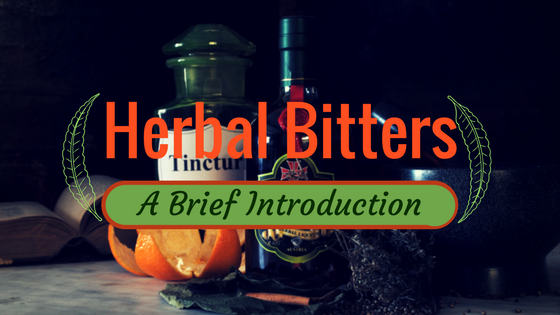 There are an unlimited amount of combinations of bitter herbs out there that can be put into these herbal bitters, and many recipes date back thousands of years. Some of the oldest recipes come from the Mediterranean region and date back over 2,000 years ago. Some of the more famous recipes are still in use today, though mostly as cocktail ingredients. The most famous of these is Angostura Bitters which is used in the traditional Old Fashioned. And for those of you who are fans of Gin and Tonic, tonic water started off as a bitter folk remedy as well. Bitters are great for everyone to use. Pregnant and nursing women should use caution with certain herbs, but an Herbal Bitter formulated with fennel and other gentle herbs can be a great asset, especially since fennel helps increase breast milk production. Those of you who have had problems with your gallbladder, pancreas, liver, or kidneys can benefit tremendously from taking bitters. People who suffer from anemia, or iron deficiency, should think seriously about adding bitters to their diet. Our bodies need bitters in order to properly absorb and use iron. I typically recommend using bitters 15 min before you plan on dining. Bitters most often come in liquid extracts with droppers, but occasionally you will find them in spray bottles. In the case of the droppers, take 1-2 dropperfuls, under your tongue. For the spray, spray into your mouth 2-3 times. When in doubt, follow the instructions on the bottle. Whatever your digestive concern, there is an Herbal Bitters formula out there for you (or you can make your own). I urge you all to talk to a nutritionist, herbalist, or other health professional about adding bitters to your daily routine. I hope I have gotten you excited about herbal bitters, and I hope that they help you throughout this holiday season. If you have any questions or comments please leave them below.